photo (Left to Right): Roger Gaskell & panel of presenters, Fred Lichtwark and a Captive audience. Around 70 people ranging from farmers, winegrowers, bankers, farm consultants, regional council staff and industry body representatives joined us to hear from the range of speakers we gathered at Poppies Martinborough. We were treated to a cross section of perspectives with Alison Dewes from Headlands consultants in the Waikato and our own local expert Phil Percy of Perception Planning opening the day – they spoke about the state of the natural environment with the significant pressure on water takes and water quality, and the increasingly regulated environment that we are operating our farming businesses within. Alison also shared her recent work with a group of Waikato farmers who monitored returns against inputs with interesting results – finding the farms ‘sweet spot’ which is the point where the maximum return is reached with the most efficient use of inputs and lower environmental impact (optimal performance!!) – better returns and better for the planet! Ed Handyside a local top performing sheep and beef farmer then spoke about his journey within their farming business and the way that he and Mel have integrated great environmental practise into their farming management – Ed’s talk was well supported with fabulous photographic evidence of the progress that has been made on their Western Lake property. After lunch we were treated to the Raglan catchment story ably told by Fred Lichtwark – this was a journey about how one man’s desire to get a decent feed of the local kai moana resulted in the transformation of a landscape. Eighteen years and 1.2 million trees later, the restoration of the natural biodiversity and snapper beds of the harbour has been restored – hugely encouraging! Geoff Burke from Agro Ecological shared the basis of investment decision making for long term sustainable farming businesses – it was great to see soils and water featuring as key drivers of the decision making process! Erica van Reenan from Beef and Lamb completed the line up with her explanation of the Land Environment (LEP) planning tool developed by farmers, for farmers to guide on farm environmental awareness and decision making. All together an inspiring lot of information which was well supported with a great venue and delicious food provided by the Poppies team. The bar opened once the speakers finished and we got a chance to mingle after what was a highly informative day. Planning – without your help we would not have been able to put on an event of this nature. Planting Day 13 July 2014 Our winter planting day at Okorewa Lagoon was Sunday 13 July. There were 25 or so hardy members and supporters who helped get around 350 plants into the ground on the bank and slope on the northern side of the lagoon. This was a fantastic effort as the bank is steep and mountain goat type skills were needed. As it was a Sunday, it was not a schools focused planting but it was great to see children there helping out. Thanks to all for coming along and bringing whanau. Thank you also to Tonide Latour and GWRC for their crucial support of this project. After the planting, Lake Ferry Hotel and DOC put on a very welcome barbeque for volunteers in gorgeous sunshine on the Lake Ferry Hotel terrace. There will be a further planting of around 250 plants during August to finish up. This means that looking ahead to winter 2015, only one more lot of planting is needed to complete the northwest section of the work at the lagoon. - Jane Lenting. ‘Growtector Display’ – a form of tree-guard, designed to enhance growth, by local ecologist Don Bell, ex-GWRC (now a Friend of SWBG) was displayed to a select audience at Okorewa lagoon on 24 April. We were given 25 units to try on this year’s planting projects.”Don has become a ‘Friend’ of SWBG.The green plastic treeguard is quite tall, and wide, (cylinder) and uses one wooden stake; specially designed black weedmat with purpose built plastic ground-pins. This was held in wonderful weather at Pautahanui. It was introduced by Lou Sanson, fromDOC, who emphasised the role of volunteer groups and corporates in conservation . Ruud Kleinpaste was the keynote speaker and had the audience in his hands with his tales of bugs and the role they play in life. I attended a workshop on restoration of specialised places and as our emphasis is on the Okarewa Lagoon, I could have spent the whole time absorbing what the presenters had to say. They stressed that before a restoration started the science had to be thought about. The method of recording progress over time, that was most successful was photographs from a set place All the presentations are on Nature Space. World fish migration day was celebrated locally at Carters Reserve (just out of Gladstone) on Saturday 24 May. Hardy souls (and SWBG members) Vanessa Tipoki and son, Vincent Edge, braved the wild weather to attend. It was well worth the effort! Carter's Reserve is a real gem of a place - a remnant wetland which is one of the last refuges for Giant Kokopu in the upper Wairarapa valley. This was a family day out with lots of activities for the kids and (my favourite) the chance to view real live native fish with local native fish experts. We saw inunga, bullies, brown mudfish (extraordinary little guys who can survive out of water) and a huge banded kokopu (who knew they grew so large.....). A fantastic initiative from the Wairarapa Moana Network. 18th March After 5' visit :Carters Reserve then to Tiffen Hill, home to SWBG members Duncan and Jan. Following a Management team meeting at the Gladstone Inn we met in the car park of Carters Reserve where the group was hosted by Gary Foster of DOC, who is a passionate advocate of the site who has been involved with its care for a number of years. Carters Reserve is one of the few remaining remnants of patchwork landscape once typical of the Wairarapa - featuring grasses, wetland, shrubland, and forest. It is home to native birds, fish, lizards, bats and endangered plants. Gary took us around the 30 minute boardwalk stopping at various sites where he explained the history and points of interest. 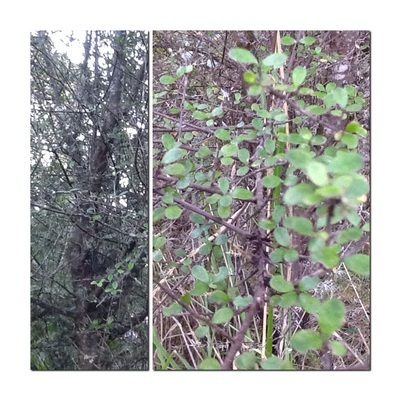 Of particular interest was the way that the site was modified with regard to hydrology - increased water flows after some remedial work in the area impacted in some stress on ancient Kahikatea stands, who while happy with wet feet generally don't appear to adapt to sudden change, and as a result many have died. However as with any dynamic environment there are a range of other plants that have come in and succeeded them, all of which appeared to be having a prolific flowering and seeding season. This will be feeding bird life and spreading the seed further within the reserve. In addition the site hosts two rare plant breeding sites (Comprosma's) that have secured the future of these plants and saved them from extinction. Gary spoke about remembering the processes that are happening in a restoration site or natural environment such as this - they are dynamic and changing places, so consideration of these natural rejuvenation processes needs to be kept in mind when planning or observing natural areas. 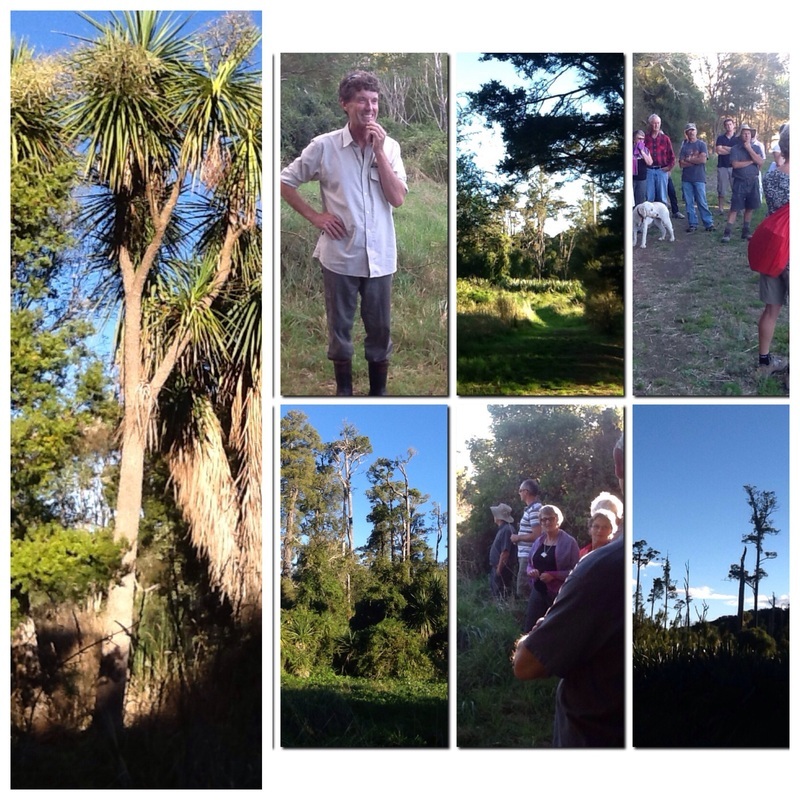 Around 7pm we headed up to Tiffen Hill, the home of Duncan and Jan (foundation SWBG members who used to live at 'Summerhills' on the way to Ngawi), where they also have 3 hectares of pasture land and garden. Duncan shared the history of the house - it was originally built by Gerald Melling for Peter Rankin (might mean something to some of you?). It then became a retreat for Buddist monks and until very recently was completely off the grid. We enjoyed a wonderful evening there - fabulous food, warm hospitality, intriguing residence and spectacular views. Thank you to everyone who helped make this evening the success that it was. 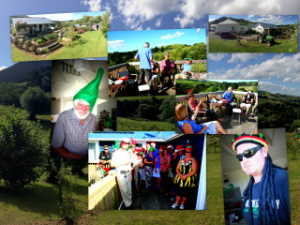 A great day was enjoyed by all. Music started from 11.00am and carried through well into the evening - there was a really good crowd throughout the day with people loving the great music, the wonderful food, the friendly relaxed atmosphere and the spectacular setting that is Lake Ferry. The South Wairarapa Biodiversity Group was fortunate to be chosen as the local community group to benefit from the day with $350 being raised through donations and raffles. These funds will be used in the vicinity of Lake Ferry (Onoke) to build on the environmental work we have been doing. It is great to get support and endorsement from our community and visitors for the work we are undertaking in this highly visible and popular location. We would like to thank all those involved with this event for the huge effort and great result. Perry Cameron acted as convener and hazard manager: 10 attendees at the hosts’ home were briefed on hazards ( minimal given the site and absence of stock). The Colton’s farm property is situated close to the eastern boundary of Lake Wairarapa, adjoining a lagoon created in mid-1900’s by the diversion of the Ruamahunga River. The farm was part of the Creech family property of 800 acres, subsequently divided and acquired in the early 1980’s. Indigenous plantings in 1982-83 along the lagoon’s edge were funded by Dept. of Internal Affairs, with support from the local Catchment Board and Conservation Society. There were no riparian rights: water troughs and canals for stock were allowed. Fish & Game became involved, in support of the lagoon as a quality habitat for wild ducks. The group travelled a short distance in two 4WD vehicles to better view the plantings (across a paddock sown with Plantain, now recognised as a herb plant of high value for sheep grazing). At the lagoon’s border the group viewed tree growth over the 30-year period. Some exotics were still in place to provide some wind shelter – significant wind damage regularly occurred, but native flora planted and re-generated (self-sown). Wind damage had been mitigated, although a 30-year Totara had been toppled in the Spring of 2013. 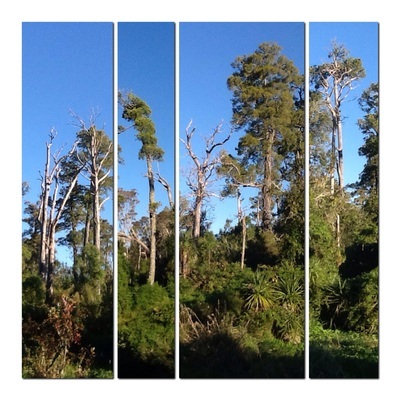 Pine and eucalypts trees were becoming more of a risk with ageing. 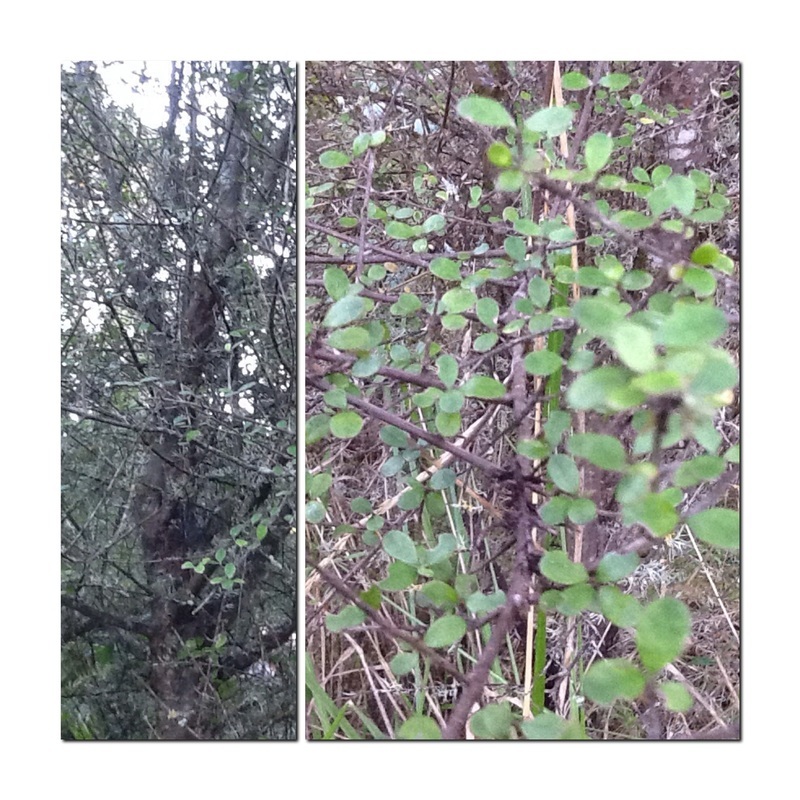 Native varieties included: Kahikatea, Manuka, Kowhai, Mahoe (Whiteywood), Karo, Coprosma, Patu, and Ngaio. Another variety could not be identified and a sample was taken for further consideration (perhaps Olearia, (‘Akeake’) – rough-leaved tree daisy. The event ended with a shared BBQ at the Colton’s home, and a vote of thanks for the hosts. Around 25 SWBG members and friends attended the last 'After 5' visit of the year and our Christmas function which was kindly hosted by Barbara, James and Evie (daughter) at Limegully, Longbush. Of great interest to the participants was the development of the house(s) - Barb and James first moved on the old army jailhouse from Houghten Bay in Wellington in 1993.. and then shifted the police house from Brooklyn two years ago which they skillfully amalgamated to make a really lovely home for them and their menagerie of animals (3 dogs, 4 cats, ….chickens, 2 kune kune pigs and some sheep and cows some of which don't actually live in the house!). In addition the property is off the grid and successfully relies on solar energy for its needs. Barb and James have also developed a lovely landscaped edible garden on a slopping site adjacent to the house. We had a great look through their QEII block which runs along the Whangahau River and links to adjacent QEII blocks of the neighbours. There was some great regeneration of natives along the river bank and beneath the much older trees in the block. There was much discussion around a number of huge natives with some hardy souls undertaking river crossings to view the biggest totara's most of us have ever seen - apparently some of this area escaped earlier milling, hence the size of the trees! The evening started at ‘JR’ Van Vliets Papawai orchard, where the members were met by Peter Rewi, of the Stream Restoration Committee. JR explained the significant improvements to the stream’s water quality, depth and high flow, and scope of the recent plantings. The removal of massive willow trees from the stream had made a significant difference. We were then welcomed to Papawai Marae and called in by Niniwa Munro. Perry spoke on behalf of the group where he expressed our appreciation of the welcome, and our shared interest in ‘mauri’, inherent in living things. We then viewed the impressive stream restoration, still in progress, behind the marae’s relatively new wooden fence. Outdoor seating was in place by the stream, and a small jetty was planned as a feeding spot for the many eels. After appropriate thank you’s, and Koha, the group moved on to the DoC owned Tate Reserve (1.5ha of weed infested native bush on Papawai Road). The benefits of significant trapping were beginning to show, with a reported increase in bird life. Rotary Club of South Wairarapa members cleared the traps and were promoting a more aggressive weed management exercise by DoC. Nine of the group then dined at the White Swan - fine food and great company. We had a great gathering of around 25 people at Vanessa and Marcus's place. The AGM was virtual (thanks to Marcus's TV and laptop), so no trees were harmed to deliver the annual reports. We welcome back to the management team Vanessa Tipoki and also welcome Dianne Buckley who has joined us for the first time - so we are now a team of eight - it is great having such willing and able participants - I am confident we will have an exciting year ahead! Big thank you's to all the Management team for their contribution to date. Following the AGM we heard from Haami TeWhiti - Ngati Kahunguni ki Wairarapa and Christine Barnett – Archeologist, who shared their knowledge of the historical significance of the Rahu Ruru pa site. This is one of the better examples of a Pa site on private land and features a unique and distinctive trench system which is readily apparent when we viewed the site. It is easy to see why the site was chosen as it delivers a brilliant vantage point from the top of the site. The day ended with some great food, wine and conversation - Thanks Vanessa and Marcus for a great day, and thanks to all those that attended. Our first of our spring feild trips was a visit to look behind the scenes at the Norfolk Road Nursery www.norfolknursery.co.nz - this is a privately owned local Nursery doing a great job of ecosourcing seed from our local area and is the SWBG's prefered supplier for tree purchases. We had an hour looking at the workings of this busy nursery which impressed us with its scale and diversity. We then had half an hour showing our appreciation by undertaking some weeding of some of his potted plants. A number of members then filled up their car boots with plants purchased on the day. Next we headed back for a coffee at Clareville. Please join us for this look behind the scenes at this popular nursery. We hosted 60 children (from Pirinoa and Kahutara Schools) and their teachers to attend an educational morning at the Lake Ferry Hotel. In addition to viewing the wonderful display material we were generously lent by Kahungunu ki Wairarapa and the Aratoi Museum we have Warren Field from the Greater Wellington Regional Council talking to us about the Tuna fishery, Toni DeLautour speaking on whitebait and a book reading of 'The Eels under Anzac Bridge' by the illustrator Viv Walker. This was followed by a look at the new plantings and a BBQ provided by the Greater Wellington Regional Council. The Community Planting Day to celebrate the opening of migration of whitebait. Over 40 volunteers completed the planting of the Lake Onoke lakefront and the Okorewa/Onoke lagoon on sunday 18th August . We completed the good work we had planned for our Lake this year. A well earned BBQ and beer followed at the Lake Ferry Hotel. We hosted display material about the Tuna (eel) and the history of our Lake (as seen at Aratoi Museum) at the Lake Ferry Hotel. This was a brilliant chance for locals and visitors to learn about the Wairarapa Moana wetlands and river system (and its inhabitants) right on your back door.